If you’re like most offices in NYC, things tend to slow down during the summer months. Whether it’s because of the humidity that keeps New Yorkers from moving at their usual high-speed pace or the fact more people are out on vacation, June, July and August give you a chance to catch up on those projects that may have fallen by the wayside earlier in the year. One of the most important of those being the food. 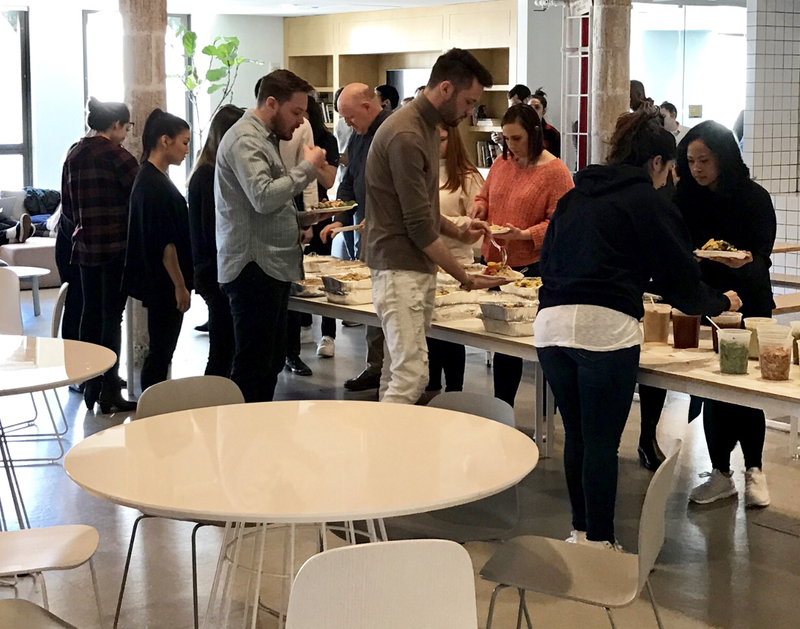 It’s time to take a look at what you’re feeding your office and how you can improve your meals and snacks to get yourself and your team eating and feeling good! Send out a survey. Get an idea of what your team likes/dislikes for breakfast, lunch (dinner if applicable) and happy hours/snacks! Ask questions such as “Do you eat what is usually provided for breakfast meetings?” “What do you typically enjoy eating for breakfast?” “Which of the snacks that we have in house do you like or dislike?” “What kind of snacks would you like to see more of?” “Do you have any cuisine requests for team lunch?” “What do you think team breakfasts/lunches are lacking?” Getting this information will give you a better idea of what can be improved with the current meals that you’re offering in your office. It’s also crucial to know what dietary restrictions you’re working with and what your team’s eating preferences are when you’re ordering for everyone. Maybe HR recently hired 3 people that are vegetarian and your COO just decided to cut gluten out of his/her diet. Make sure that you include questions on the survey similar to “Are you a meat eater, vegetarian, vegan, other?” “Do you have any food allergies? If so, what are they?” so that you can get a clear breakdown of dietary restrictions to keep in mind when putting a meal together, especially if someone on your team has Celiac’s disease or a nut allergy. Finally, make the survey anonymous so that everyone can give their input without fear of judgement (food judgement is real, people!) and anyone in your office that does have a specific request that they want you to be aware of can include his/her name. Read each survey and starting implementing! Take the time to go through each response that you receive and start making changes in your office based on your team’s comments. At FoodtoEat, we’ve noticed that a lot of companies want to eat healthier during the summer but don’t want boring options. An easy way to do this for lunch is to start introducing more unique cuisines that have proteins, veggies and low-carb starches that are delicious and will keep your team feeling full but aren’t too heavy, such as Vietnamese, African and Cuban. Or try something light and different like a build your own poke bowl! It’s important to also have healthy snacks around your office so that when people do start snacking (which they will), they are eating healthy snacks rather than chips, cookies, candy, etc. We suggest replacing chips with pretzel thins, air-popped popcorn or nuts (almonds, pistachios, peanuts), cookies with granola bars or dark chocolate and candy with low-calories ice pop and dried or fresh fruit. Send out a meal feedback form post-meal. Once you’ve made the changes that your team requests and ordered a meal based on their suggestions, we advise sending out a meal feedback form to see what everyone thought of the food and gauge whether or not you’re on the right track. The easiest way to do this is to create a template for each meal type (breakfast, lunch, dinner, happy hour) and send it out to everyone in your office 30 minutes or an hour after they’re done eating. This way they can write what they thought while everything is still fresh in their mind. Majority of the time most people in your office probably won’t fill out this form but a handful will and will give you honest and constructive criticism. And once other coworkers start realizing that their feedback can have an influence on what is ordered, they’ll start speaking up as well! Give yourself some credit (and others will too)! Once you’ve created your survey and feedback forms, make this a recurring process that happens after each meal so that people in your office get used to the emails and look forward to filling them out! Setting up this system will allow you to get the feedback you need to keep coordinating awesome meals for your coworkers and keep your team happy. However, make sure that you keep in mind that no matter what you do, you can’t please everyone. There will always be someone who complains about the food or wants something different. But at the end of the day, making an effort to order a meal that has something for each dietary preference or isn’t from the deli below your building won’t go unnoticed. It may require a little more work on your part but taking the initiative on an area that’s so pivotal to your office culture will make you look good and your coworkers will thank you for it! Next Entry:Beat the Heat with Our 20 Minute Taco Salad!